B.Ed 4 years With Inter Qualification - Integrated B.Ed Teacher Education Programme Guidelines : NCTE 4 Years Integrated B.Ed with Intermediate Qualification, Fee, Course Period, Eligibility and Admission Procedure released. NCTE National Council for Teacher Education launching 4 Years Integrated Teacher Education Programme all over the country Best B.Ed Programme by NCTE with Intermediate / 12th Standard Educational Qualifications. NCTE 4 Years Integrated B.Ed with Intermediate Qualification File No: NCTE-Regl011/80/2018-MS(Regulation)-HQ.NCTE 4 Years Integrated B.Ed now can be studied with Senior Secondary Qualification. Eligibility Details given below. The National Council for Teacher Education (NCTE), a statutory body under Ministry of Human Resources Development has been established under an Act of Parliament (73 of 1993) with a view to achieve planned and coordinated development of teacher education system and maintenance of norms and standards and matters connected therewith throughout the country, (except Jammu and Kashmir). It proposes to launch a 4 Years Integrated Teacher Education Programme (ITEP), for which entry qualification is 12th standard with 50% marks. The ITEP imbibes some of the best practices of teacher education in the world and aims to bring about a qualitative change in preparation of teachers for the school system. NCTE invites online applications from COMPOSITE institutions from 03.12.2018 to 31.12.2018 for grant of recognition/permission to 4 Years Integrated Teacher Education Programme (ITEP) for the academic session 2019-2023. The details are available on NCTE website: www.ncte-india.org. It may be noted that only those institutions which are "composite institutions", as defined in clause 2 (b) of Regulation 2014, (reproduced below) on the date of making the application shall be eligible for this programme: " (b) 'composite institution" means a duly recognized higher education institution offering undergraduate or postgraduate programmes of study in the field of liberal arts or humanities or social sciences or sciences or commerce or mathematics , as the case may be. at the time of applying for recognition of teacher education programmes, or an institution offering multiple teacher education programmes." The applicant institutions which do not qualify as per clause 2 (b) of NCTE Regulation, 2014 (Supra), shall be treated as ineligible and their applications are liable to be rejected and processing fees paid by them may be forfeited. In case of any clarification, the applicant institutions may get in touch with NCTE officials on the following mobile Nos. during office hours (9.30 am to 5.30 pm Monday to Friday). 1. Short title and Commencement – (1) These regulations may be called the National Council for Teacher Education (Recognition, Norms and Procedure) Amendment Regulations, 2018. The Integrated Teacher Education Programme (Arts and Science streams) shall be of four academic years comprising eight semesters, inclusive of field-based experiences, teaching practice and internship. Any Student-teacher who is unable to complete any semester or appear in any semester–end examination, shall be permitted to complete the programme within a maximum period of six years from the date of admission to the programme with the approval of the Managing Committee. (a) Candidates with formal education from a ‘School’ as defined in clause (n) of section 2 of the Right to Education Act, 2009, with at least fifty percent marks in Senior Secondary or plus two examination or its equivalent, are eligible for admission. (b) The relaxation in percentage of marks in the Senior Secondary or plus two examination or its equivalent examination and in the reservation for Scheduled Caste or Scheduled Tribe or Other Backward Class or Persons With Disabilities and other categories shall be as per the rules of the Central Government or State Government or Union Territory Administration, whichever is applicable. (a) The basic unit shall comprise of fifty students each in the programme. (b) The institution shall be permitted to opt for units of either Arts stream or Science stream, or both, in case the institution is eligible for more than one unit. (a) Admission shall be made on merit basis, considering marks obtained at Senior Secondary or plus two level or equivalent examination or in an entrance examination, or any other selection process as per the policy of the University or State Government or Union Territory Administration. (b) At the time of admission to the programme, the candidate must indicate the subject in which he or she proposes to take the B.A or B.Sc Degree. Admissions shall be on the basis of order of merit and availability of seats. Any change in the choice of subjects shall be made within one month from the date of commencement of the programme. The institution shall charge only such fee as may be prescribed by the affiliating body or State Government or concerned Universities in accordance with provisions of the National Council for Teacher Education (NCTE) (Guidelines for regulation of tuition fees and other fees chargeable by unaided teacher education institutions) Regulations, 2002 and shall not charge donations, capitation fee, etc. from the students. The curriculum and the implementation of the programme may be based on the model curriculum developed by the NCTE. The concerned Universities or Institutions conducting this programme may adapt or modify this model curriculum, as per local requirement for the conduct of this programme with prior approval of the NCTE. For an intake of one basic unit of fifty students and two units of one hundred students, faculty shall be recruited for the curricular areas, with the specified essential and desirable qualifications and specialisation. Additional faculty shall be appointed subject to provisions that the faculty requirements for the curricular areas mentioned below are fulfilled. 2. Assistant Professor- in Liberal Discipline and Pedagogy or Educational Studies. The institution shall have a Managing Committee constituted as per the rules of the affiliating University or concerned State Government, if any. In the absence of such rules, the institution shall constitute the Managing Committee on its own. The Committee shall comprise of the representatives of the sponsoring society or trust, physical educationists, representatives of the affiliating University and of the staff. 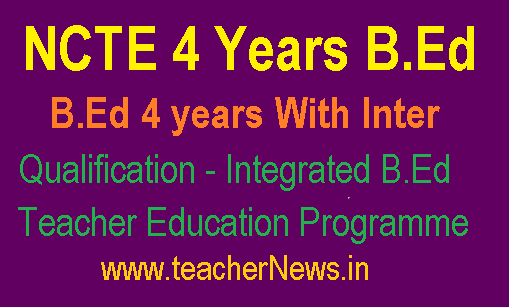 NCTE 4 Years Integrated B.Ed with Inter Qualification Norms, B.Ed 4 years With Inter Qualification - Integrated B.Ed Teacher Education Programme Guidelines Download.